Imagine: a food-obsessed Pinoy living in HK given the opportunity to share her favorite eateries with food lovers from the Philippines. Think: crummy looking hole-in-the-walls, noisy eateries, chic bars, grand palaces of dining. Disregard: weight, health and wallet concerns. 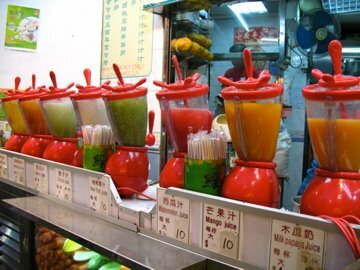 Visualize: a trip to Macau for just 1 meal. Plan: a food trip that will leave you hungry for more. Joy Hing (265-276 Hennesy Road Wan Chai): Tucked away on a side street this tiny, inexpensive place with long lines serves very lean yet juicy “cha siu” or bbq pork and roast suckling pig. Those who have issues with hygiene should just order “take-away”. 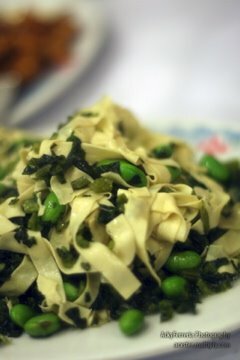 Wang Fu (65 Wellington Street, Central 21218089): Try their pea shoot and pork dumplings or any dumpling of the day. Most tables will have something from the pictures posted outside, so take your pick from there. 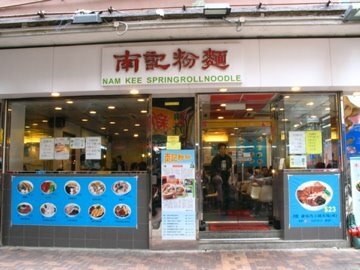 Ser Wong Fun (30 Cochrane St. Central 25431032): Order the liver sausage rice, and variety of soups; the intrepid can try the snake soup! Ning Po Residents Association (4/F Yip Fung Building, 12 D’Aguilar Street, Lan Kwai Fong, Central 25230648): Just pay HKD 20 to get a membership card. Try the kung pao chicken, chive pancakes, fish strips with ginger and leeks, tofu hotpot, lion’s head meatballs (a bit too fatty tasting for me but it’s not a common dish back home so try it) and whatever the waiter recommends. No English menu. Booking highly recommended. 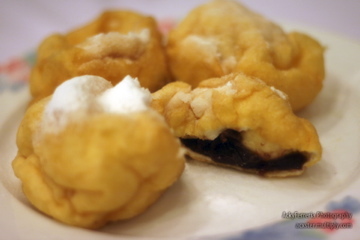 Law Fu Kee (144 Queen’s Road Central, Central) At Chee Kei order the fried dace fish ball with clam sauce – the clam is salty, like bagoong. It takes a while to get used to this dish. A more “genteel” choice would be afternoon tea at the lobby of The Peninsula (Salisbury Road, Kowloon 29202888) or at The Verandah (The Repulse Bay 22922822). There’s a lot of history and nostalgia attached to both places. 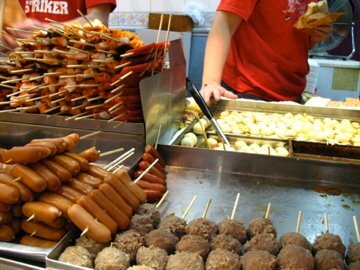 For the more adventurous, nothing beats HK street food. 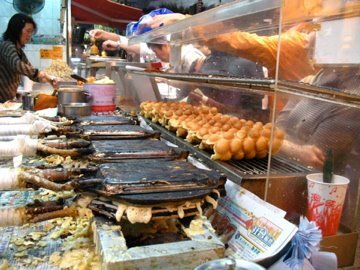 Deep-fried vegetables and cuttlefish tentacles, rice noodles, “fake” siomai, all kinds of skewered “balls”, waffle, fruit juices squeezed at every corner with no added sugar syrup or water, stinky tofu (smells like athlete’s foot, tastes better than expected). Alain Ducasse’s Spoon (Intercontinental Hong Kong, Salisbury Road, Tsim Sha Tsui 23132256). 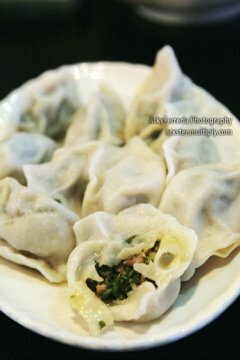 Crystal Jade La Mian Xiao Long Bao (IFC Mall, Times Square, Harbour City): It may be a chain and located in the mall, but the food always satisfies. Order the xiao long bao, la mian with minced meat and spicy mushrooms, la mian in hot and sour soup, crispy eel, fried prawns with salty egg yolk, crispy crab meat and mushroom pastry “wuxi” style, braised pork with beancurd sheet, Shanghai noodles, sauteed eggwhite with conpoy, deep-fried soufflé ball with red bean paste for dessert. 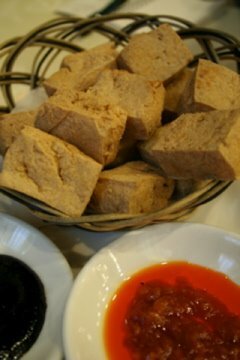 Tung Po (2/F Java Road Complex, 99 Java Road North Point 28809399). 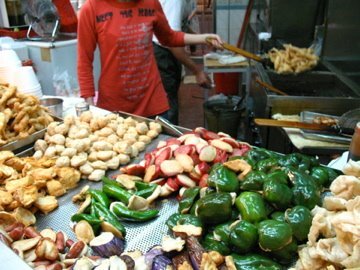 A dai pai dong, or hawker/street side stall. Order the duck rice and prawns with salty egg yolk. Wondering where the fashionable and knowledgeable go for drinks? Red (Podium 4, Two IFC 81298882) for the relaxed vibe under the night sky. Zuma (Level 5 and 6 The Landmark Atrium, Central 36576388) for its interiors and fashionable crowd. Lotus (37-43 Pottinger St. Central) They have a resident mixologist. Enough said. And Macau? Let’s not forget that gambling mecca that’s only an hour’s ferry ride away. If you could eat only 1 meal there, go to A Lorcha (Rua Almirante Sérgio No. 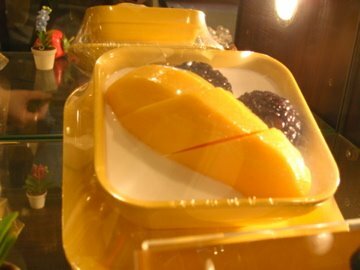 289 Inner Harbour Macau 853- 28313195). Call and book because they’re always full. They have the friendliest Pinoy waiters, and the most delicious Portugese food. Order the sopa de mariscos, callo verde, chorizo, bacalhau fritters, bacalhau with potatoes and cream, grilled lamb chops, grilled chicken, African chicken, seafood rice, clams with beer and tomato sauce or clams Lorcha style, and the tender oxtail stew. Pictures care of my friends Acky Ferreria and Tehlin Betts. last time i was there, i tried a very unusual dish, and for the life of me, i cant remember the name of the dish (shame on me). i do remember that its from some part of the stomach of the cow, and at any given time, would only have less than servings a day. ate at the fourth level. i also enjoy spring garden...president fish is absolutely yummy. was running a fever, but i didnt care. hahahaha. i definitely share your views about the macau restaurant. in case you have time, there is a restaurant near the old church at macau. (sigh - another name that escapes me at the moment). but grilled fish would be the house specialty. yum. 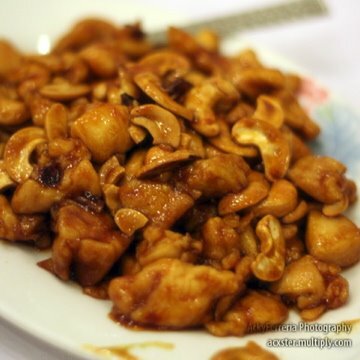 Sakai, I haven't tried Guangdong myself but will soon. Thanks for the tip. Re: Happy Garden, I was disappointed when I tried it once so I didn't include it. Maybe it was a bad day and it's time to go back and give it another go. Monchu, was that cow's stomach white, cut in strips and served like a salad with a lot of sliced leeks? I had a dish like that in Water Margin, which is Hutong's sister restaurant in Times Square. It was delicious but with an acquired texture. Yung Kee and Maxim's are tried and tested favorites, both are good but full of tourists sometimes. 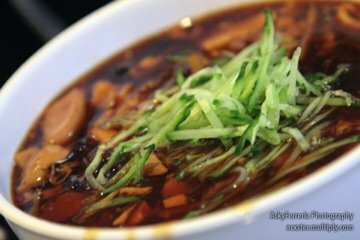 Check out this amazing blog http://chaxiubao.typepad.com/, for HK and China eats. There are so many small places in Kowloon and the New Territories I haven't tried yet. If you can go around with a Cantonese speaker you will discover far far more than what I've listed. Add my vote for the Ning Po Association, actually there's a Hangzhou and Shanghai association that's very good too, but Shanghainese food is a dime a dozen in HK. There is so much food, so little time to try everything in HK. Add the extensive Indian/S. Asian places there too and golly, it boggles the mind. Thanks for the suggestions Ragamuffin Girl! 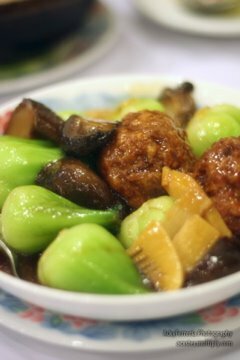 You and chasiubao are good resources to turn to for updated HK resto reviews.